Edited By – Felix*, Kaay Alexi Shelby*Voice [Background Pan Right Speaker] – Visionary*Voice [Lead Talk] – Felix Stallings Jr.
A1. Originally released on Power Music. There was such a demand for it on the underground circuit that I decided 2 go for it once more. Recorded in my parents basement. A2. Recorded in my vintage stage of mind. Now ask yourself, "Where is your past." Recorded at Clashbackk Studios. B1. Harry Havana at his best, wipe the tears from your eyes. "Where have you been, my world." There's not much time... Recorded at Clashbackk Studios. B2. Chillout made for listening, not bangin'. But you can if you like. Recorded at Clashbackk Studios. C1. The original was bootlegged during the music music conference. Gave out 5 cds. Ruled one out. You know who you are. That made me create a new version. But thanks for the hype anyway. Recorded at Clashbackk Studios. D1. Careful Boppers don't get lost in the Pop... Recorded at Clashbackk Studios. D2. The experimental track track on the album. I was in the zone. Recorded at Clashbackk Studios. E1. Recorded during the Phuturehead Period. I was sitting on it with 40 other tracks. Sent this one 2 Lisa Loud so she said go with it, and I did. F1. Sounds more like a train. Hold on for the ride of your life! Recorded in 1 hour at Clashbackk Studios. G1. Released in 1993. Originally on Soma, reworked by Frankie Bones. Frankie decided 2 do his own version on an acid tape. -Heard it on his mic CD. -Loved it and went with it. This version has never been released. -Enjoy. Original appears courtesy of Soma and Clashbackk recordigs. G2. Title track basically. 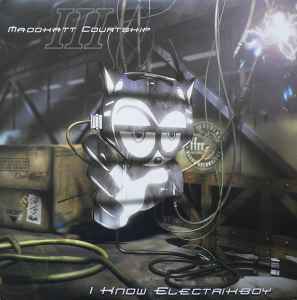 Elektrikboy is in all of us who can relate 2 the music in electric soul. Recorded at Clashbackk Studios. H1. Elektrikboy's hangout. This is where he free's his electronic mind from the Cosmic Pop. Recorded at Clashbackk Studios. The 4x12'' vinyl version is full of misprint errors. The sound quality is really good, but i prefer the cd version, with more tracks and different mixes. and pop music, something original, something really cracking, buy and listen. Inspired by the 80s, made in late 90s, it influenced Daft Punk, et al. Its so underrated but was hugely popular. A must on top 20 albums for those born mid 1970s.